Living in the US and have access to Amazon Prime? It might just be your lucky day! The company is running a promotion in which you, plus your friends and family, can see Aquaman early, no strings attached. Here’s how to get it sorted now before tickets dry up. First things first, make sure you’re free at 7pm on December 15, as that’s the only day this deal runs for. That’s six days before the original US release of Aquaman on December 21, and, if all goes well, could be an intriguing sign of things to come in the industry. You’ll also have to make sure you have an AMC theater, ArcLight Cinemas, or a Regal chain near you, though you can check if there is on the ticket page (see below). Then, head on over to the Amazon Aquaman page. 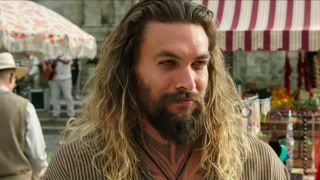 You’ll be greeted by two wonderful things: a link to early Aquaman tickets and a smouldering Jason Momoa asking you to click said link. Once you’ve sorted out who is coming, log in via Amazon Prime and buy your tickets. Simple as that. You’re going to see Aquaman early! However, if you’re in the UK and feeling a little left out, dry those tears safe in the knowledge that Aquaman gets a general release on December 14. How’s that for an early screening? Either way, you’ll avoid the FOMO.